My personal favorite take-away from Ruth Barefoot’s webinar, Wayfinding, the San José Way, was the idea of celebrating your library. There is so much goodness happening in libraries across the country, that I can easily generate a long list of reasons to support Ruth’s idea. 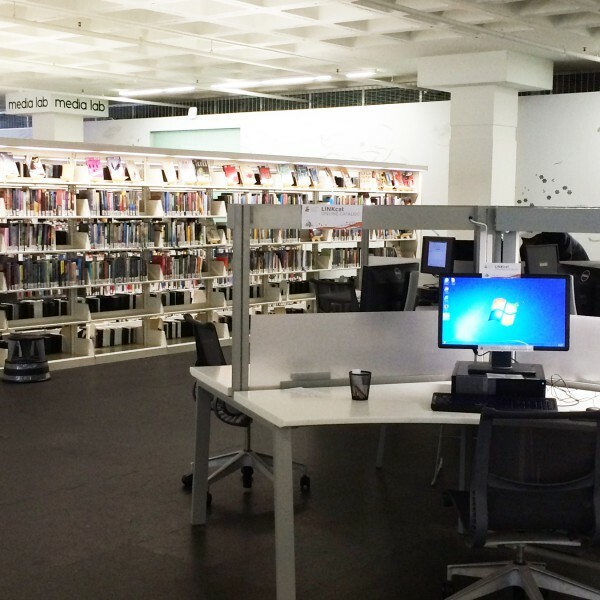 On the flip side, there is the Pew Research Center finding that is likely a thorn in the side for many of you, “Only 25% of Americans feel they know most or all of what their library has to offer.” Another likely thorn — those who proclaim libraries are dead because they can find everything they need on the Internet. Wouldn’t it be great if 1 by 1 you could take each of these critics on a personal tour of your library, and sit next to them in some of your classes? As crazy as these ideas sound, what if everyone who stepped through your doors felt like they were on a guided tour? Not the kind of tour where someone is talking at you non-stop through a loudspeaker. This tour would be almost magical. There would be freedom to explore, yet information would be presented at the precise moment it’s needed, as if you were reading their minds. Imagine such a tour at your library . . . starting NOW! Customers arrive, clearly knowing they’re at your library. They walk through your doors and confidently proceed with precise knowledge of their destination or they scan the environment, locate a directory, and figure out their next steps. Maybe you have staff who personally welcomes them to your library. Soon after arrival, present visitors with news of the day’s events, upcoming classes and new arrivals, creating moments of discovery. 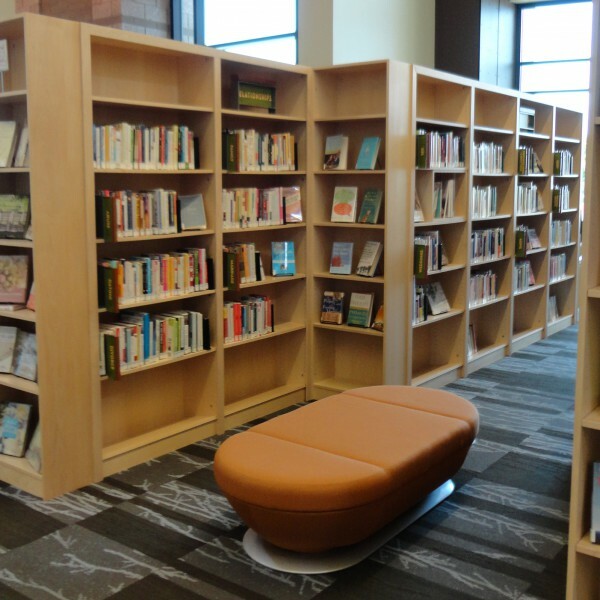 What’s your perspective of your library’s first impression? Neutral? Negative? Positive? Welcoming? What opportunities do you see to move your customers’ experiences with your library deeper into the realms of positivity and welcoming? 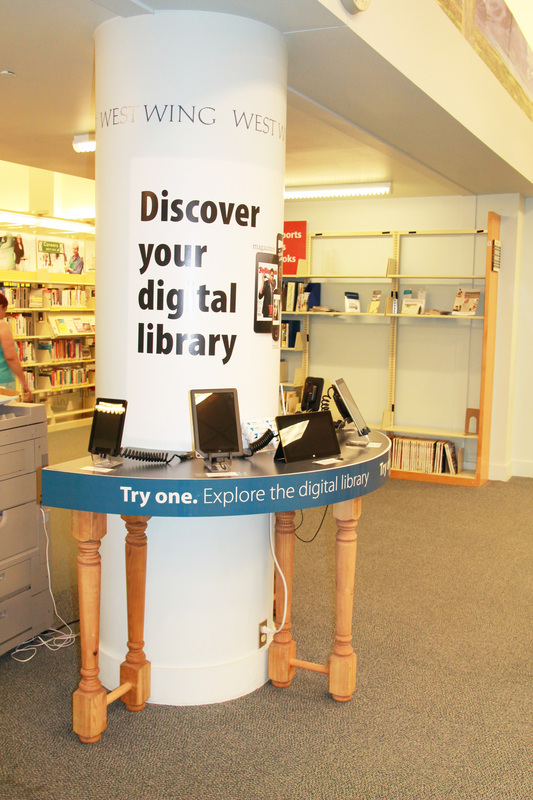 The directory orients visitors, giving general guidance on what services and parts of the collection you’ll find on each floor of the library. 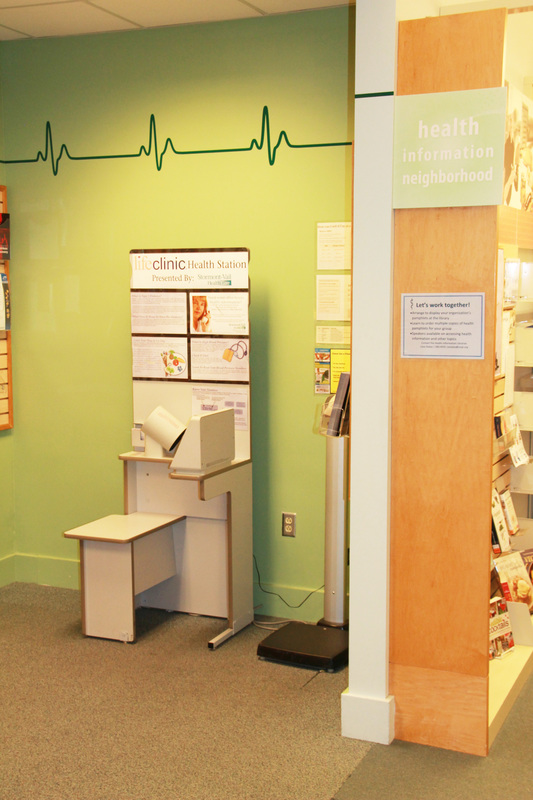 Floor directories and maps placed inside the main entrance help visitors quickly find their way. 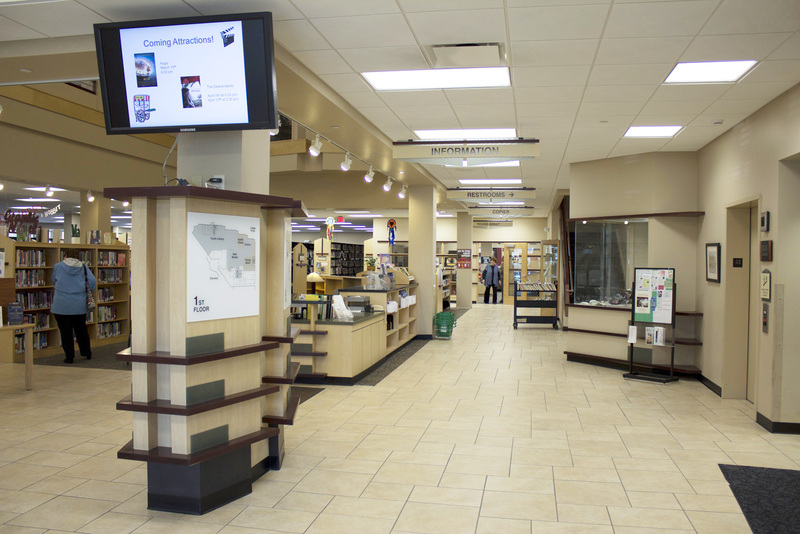 Co-located digital signage shares library news and event information. 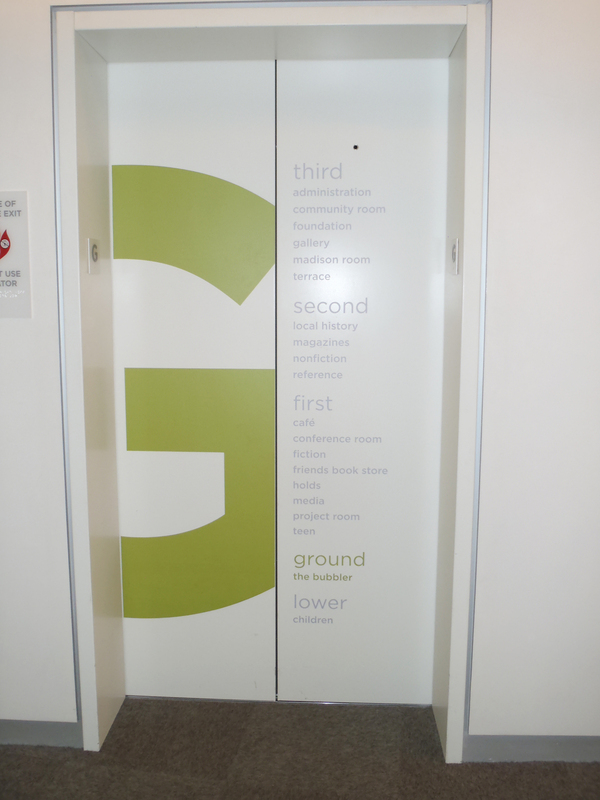 Going up? 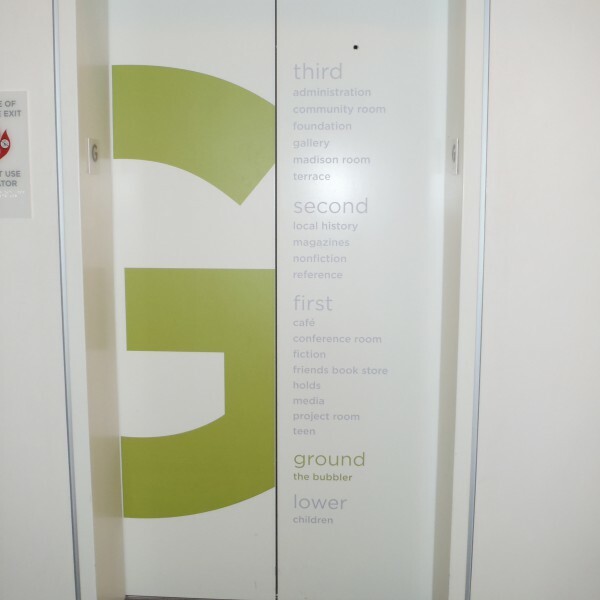 Decide which floor to visit while you wait for your ride to arrive. As your customers continue on their journey, the compositions of visual elements they see create a landscape to navigate. 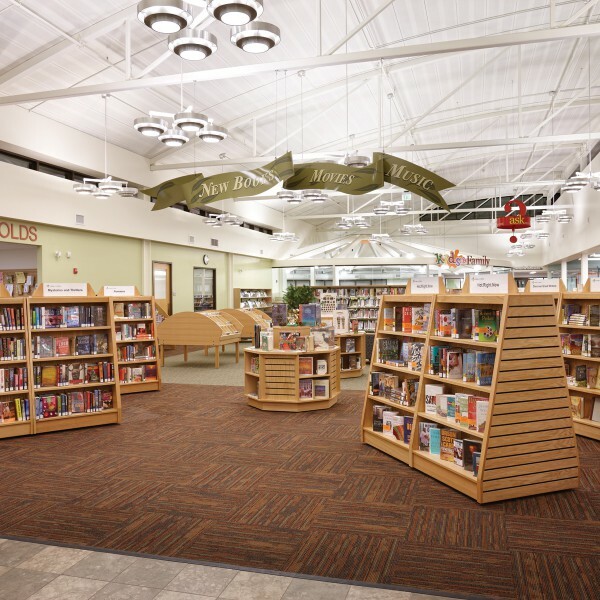 Flooring, furnishings and the application of color play a significant role in shaping place, community and identity. 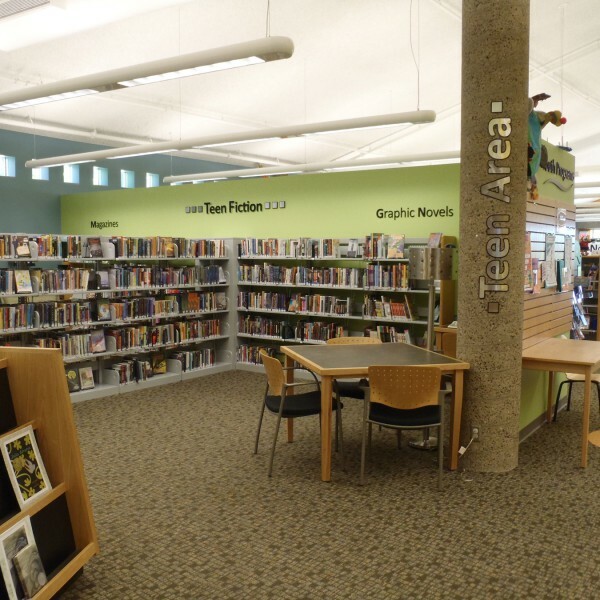 Overhead signs, ceiling or wall mounted banners and lettering are common types of signs that identify and guide users into spaces or zones within the library. Architectural elements such as columns, loft spaces, atriums and “focal point” walls should be leveraged to enhance wayfinding. 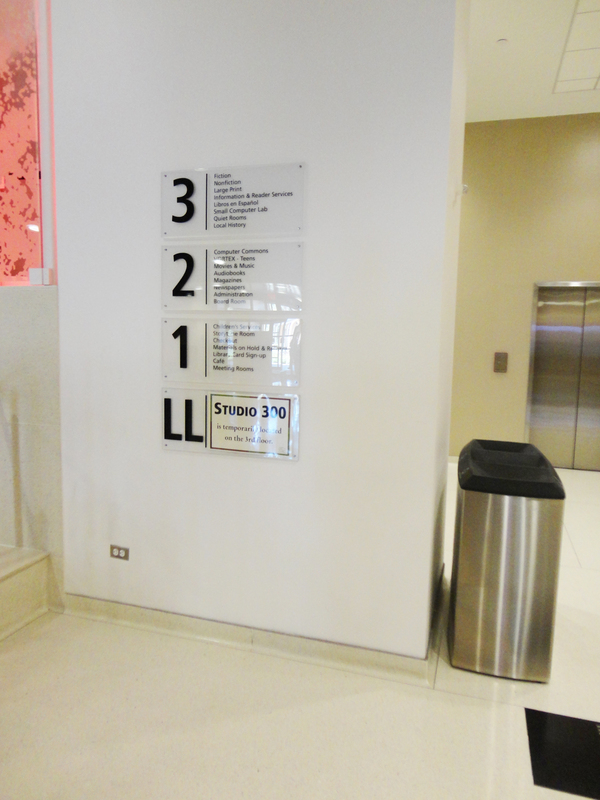 From the main entry there are highly visible signs guiding visitors into the library. Easy-to-read hanging signs delineate areas of the collection. 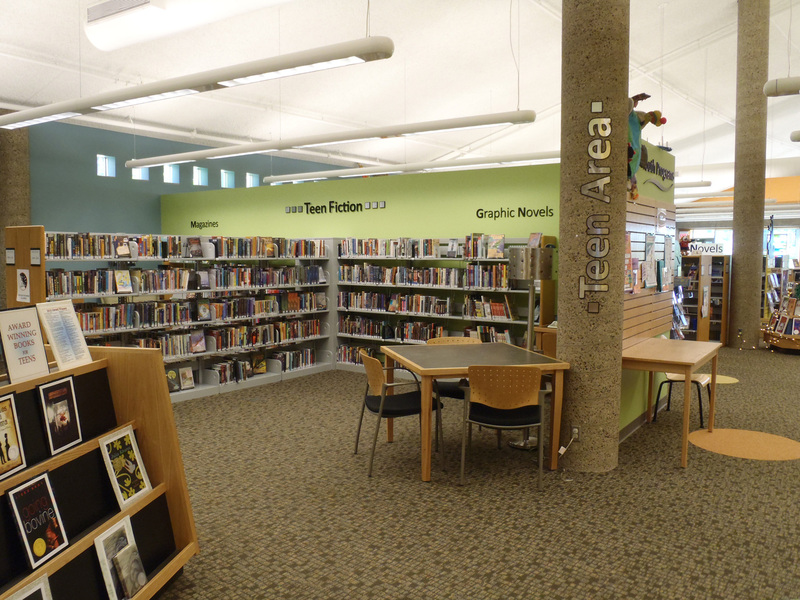 The Teen Space is easy to spot, maximizing structural columns, and the creation of a focal point wall clearly signed with contrasting individual letters. This is where the magic of the self-guided tour comes into play. 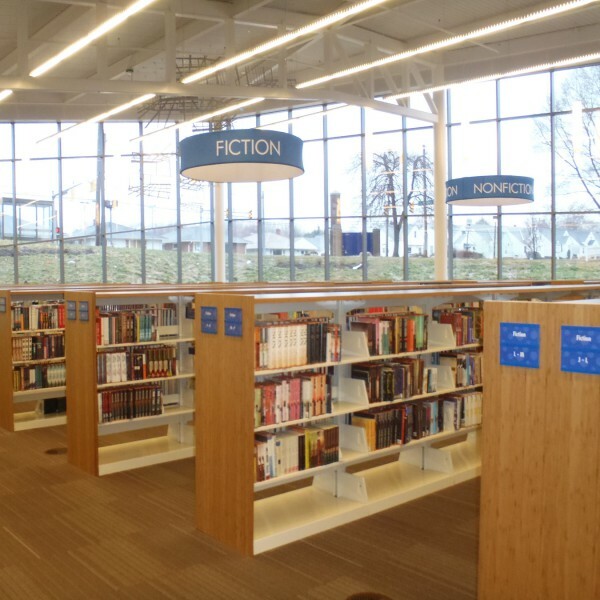 Knowing what library signs are necessary and those that will enhance the user experience, balanced against creating opportunities for discovery without clutter. Merchandising is a strong component of discovery too. Take advantage of your resources, especially architectural elements, end panels and canopy tops. 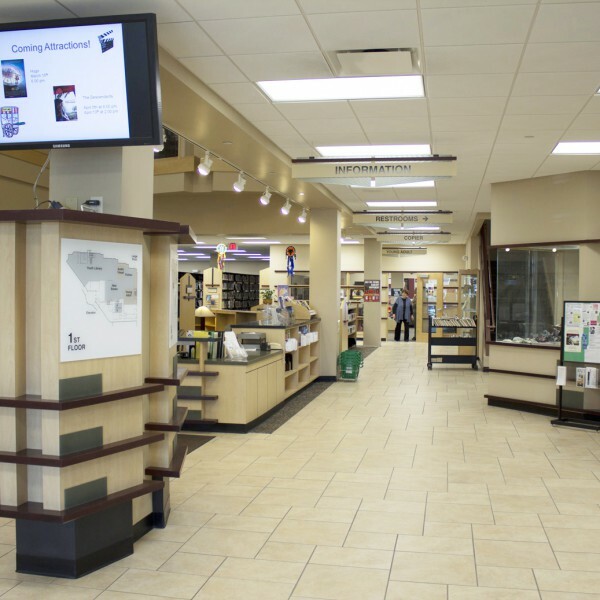 Face-out displays are widely known to increase circulation, and some libraries are commingling formats on their shelving — hardcover, paperback, audio, video in a single location. This gives customers all their options in one place and creates an opportunity for awareness of other formats or related services. 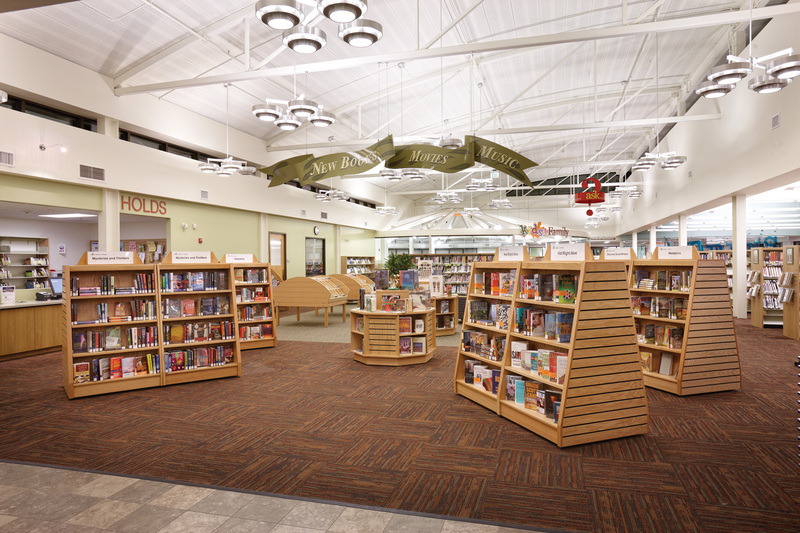 WordThink methods were adopted for arranging their library materials in easy-to-understand, customer-focused categories. Shelf-level signs further breakdown topics within the topical neighborhoods. 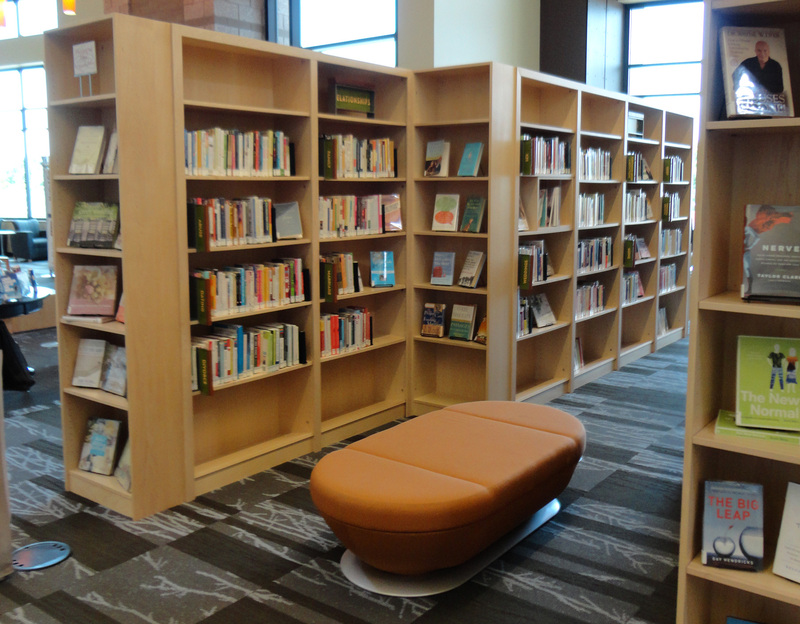 The non-fiction collection is organized into information neighborhoods. 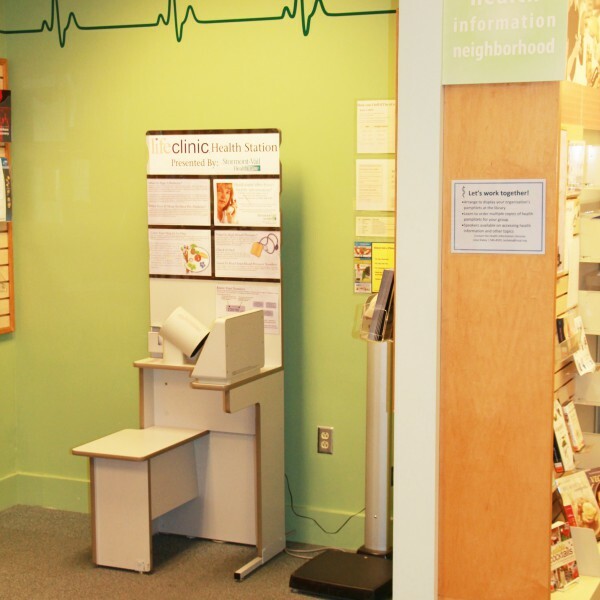 A blood pressure cuff and scale are available for visitors to monitor their health. 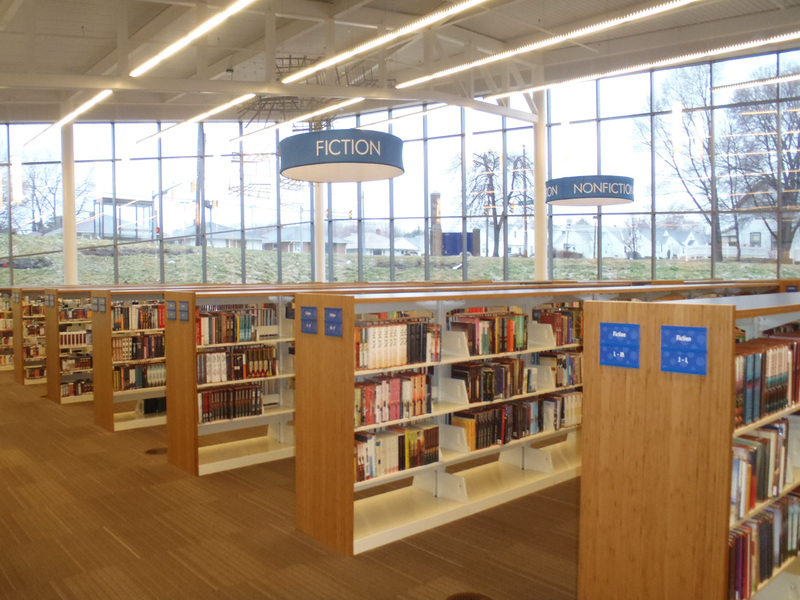 This column was transformed into a directional focal point, highlighting new services and reinforcing the West Wing location of the library. Some positive research figures from Pew Research Center shows that many Americans are visiting libraries to attend meetings, classes and programs — all of which have starting times. While we all strive to be on time, if not early, there is nothing worse than being unable to find your destination when pressed for time. 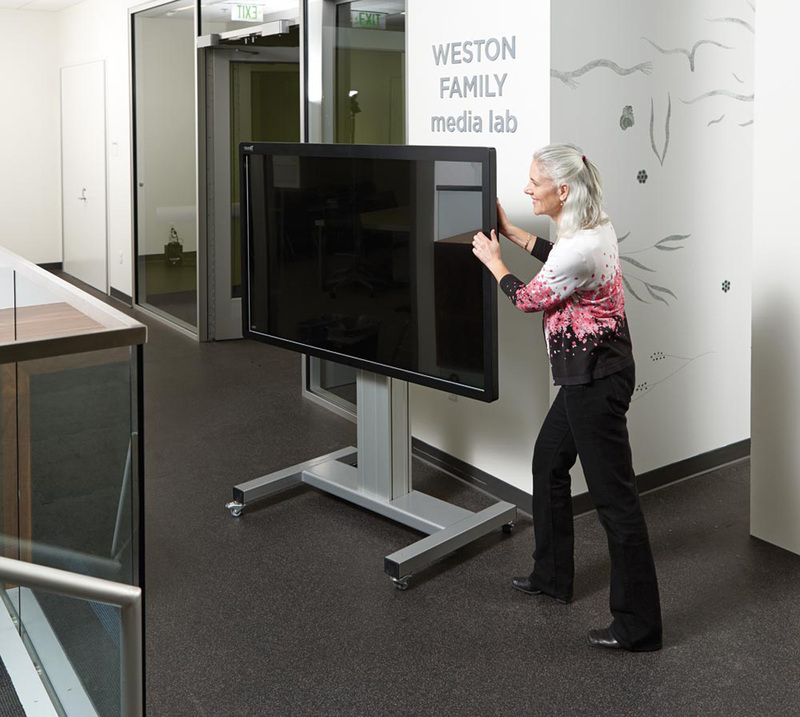 A directory can get visitors off on the right path, but meeting rooms are often tucked away in corners of the building or on other floors. Reinforcing signs along the way are important, and clearly identified rooms give them confidence they’ve arrived at the right location. Even a wall can communicate. 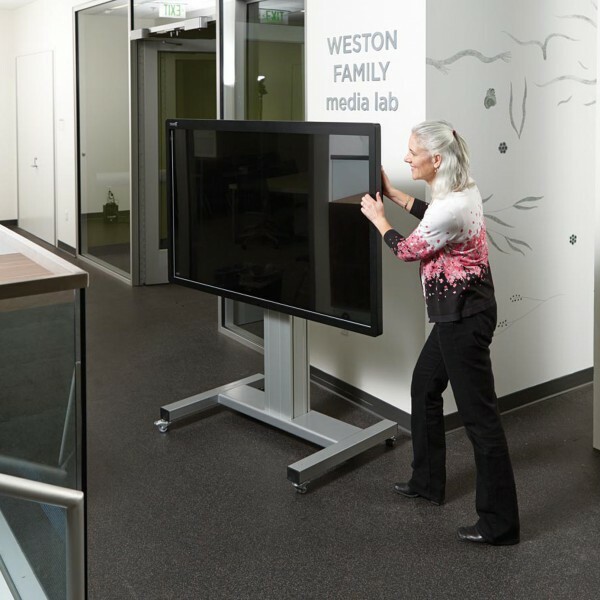 To ensure customers take advantage of the media lab’s great programs, a structural column serves as a beacon drawing customers near the entrance located just around the corner. 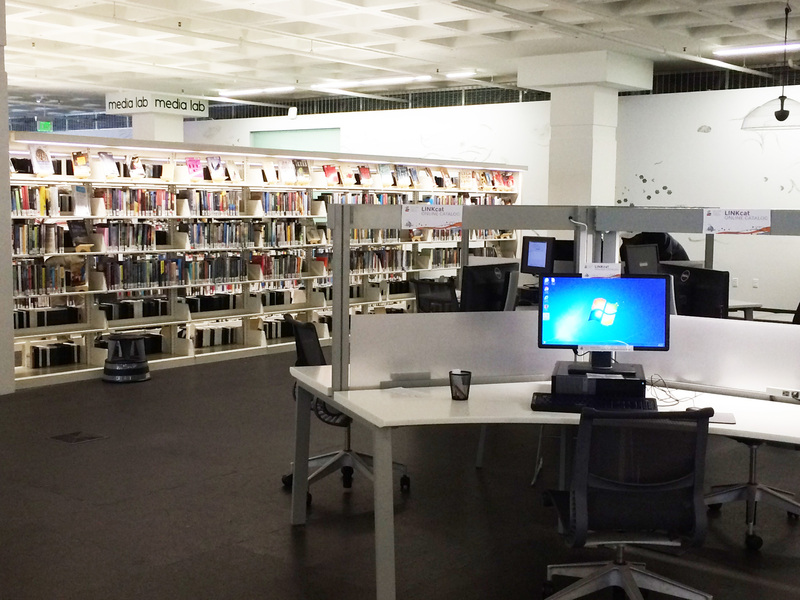 I think it’s safe to say libraries are in a state of transformation, and that a large component of this shift includes changing public perceptions and opinions. There is no easier place to start than with your current library users. The more they understand and know the full scope of what you offer, the more likely they are to become your best advocates and supporters. Directing customers to restrooms can be an extremely urgent question. 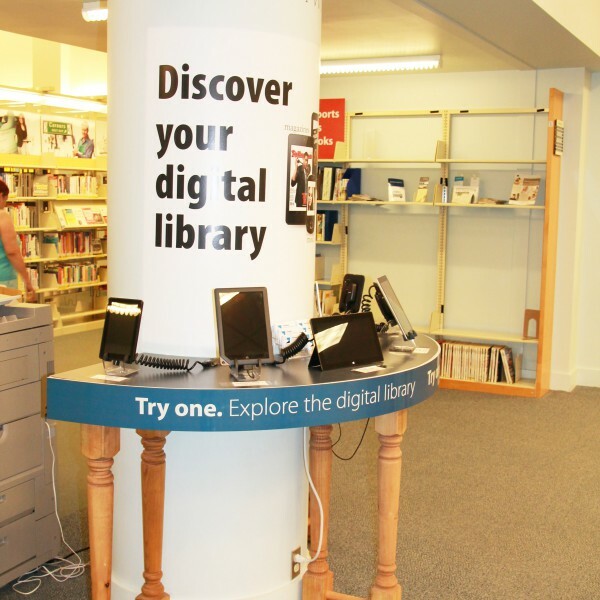 However, effective signage can address these types of easy questions, freeing up time to help customers in meaningful ways, such as homework help, database research and completion of job applications, creating positive impressions about the library and its smart, helpful staff. 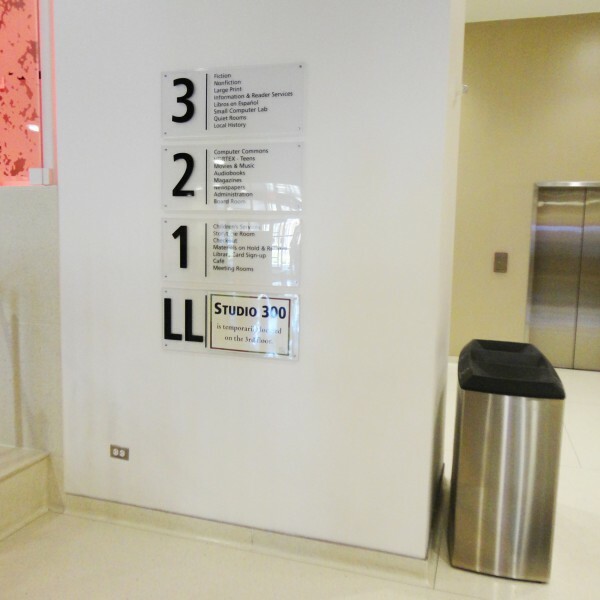 This is the first of a 4-part series on library wayfinding and signage from Demco. Anythink Visual Merchandising Guidelines are available for review for insights on how they engage their customers with their collection.